An Viking amo an mga taga Escandinavia nga mga ekplorador, sundalo, negosyante ngan pirata nga nansulong ngan nan-angkon hin halapad nga katunaan ha Europa ha urhi nga ika 8 ngadto ha unhan han 11 siglo. Brink, Stefan (2008). "Who were the Vikings?". In Brink, Stefan; Price, Neil. The Viking World. Routledge. pp. 4–10. ISBN 9780415692625. Fitzhugh, William W.; Ward, Elisabeth I. (2000). Vikings: The North Atlantic Saga ; (an Exhibition at the National Museum of Natural History, Smithsonian Institution, Washington D.C., April 29, 2000 - September 5, 2000). Washington: Smithsonian Institution Press. ISBN 9781560989707. http://books.google.com/books?id=fpZgQgAACAAJ. Hall, Richard Andrew (2007). The World of the Vikings. Thames & Hudson. ISBN 9780500051443. http://books.google.com/books?id=bK1TngEACAAJ. Hall, Richard (January 1990). Viking Age Archaeology in Britain and Ireland. Shire. ISBN 9780747800637. http://books.google.com/books?id=Av2IngEACAAJ. Lindqvist, Thomas (4 September 2003). "Early Political Organisation: (a) An Introductory Survey". In Helle, Knut. The Cambridge History of Scandinavia: Prehistory to 1520. Cambridge University Press. pp. 160–67. ISBN 9780521472999. http://books.google.com/books?id=PFBtfXG6fXAC. Roesdahl, Else (1998). The Vikings. Penguin Books. ISBN 9780140252828. http://books.google.com/books?id=148Meh36BxEC. Sawyer, Peter Hayes (1 February 1972). Age of the Vikings. Palgrave Macmillan. ISBN 9780312013653. http://books.google.com/books?id=WBGemwEACAAJ. Williams, Gareth (2007). "Kingship, Christianity and coinage: monetary and political perspectives on silver economy in the Viking Age". In Graham-Campbell, James; Williams, Gareth. Silver Economy in the Viking Age. Left Coast Press. pp. 177–214. ISBN 9781598742220. http://books.google.com/books?id=KbiVoK0rg1gC. Askeberg, Fritz (1944). Norden och kontinenten i gammal tid: studier i forngermansk kulturhistoria. Almqvist & Wiksells boktr.. http://books.google.com/books?id=7FTUAAAAMAAJ. Downham, Clare (2007). 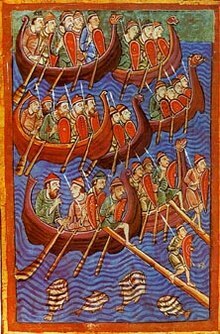 Viking kings of Britain and Ireland: the dynasty of ́Ívarr to A.D. 1014. Dunedin Academic Press. ISBN 9781903765890. http://books.google.com/books?id=j-sWAQAAIAAJ. Hadley, Dawn (2006). The Vikings in England: Settlement, Society and Culture. Manchester University Press. ISBN 9780719059827. http://books.google.com/books?id=9waAwoLwZUMC. Heide, Eldar (2005). "Víking – 'rower shifting'? An etymological contribution" (PDF). Arkiv för nordisk filologi. 120. C.W.K. Gleerup. pp. 41–54. http://eldar-heide.net/Publikasjonar%20til%20heimesida/viking%20rowshift.pdf. Heide, Eldar (2008). "Viking, week, and Widsith. A reply to Harald Bjorvand" (PDF). Arkiv för nordisk filologi. 123. C.W.K. Gleerup. pp. 23–28. http://books.google.com/books?id=6bIbAQAAMAAJ. Hodges, Richard (2006). Goodbye to the Vikings: Re-Reading Early Medieval Archaeology. Gerald Duckworth & Company Limited. ISBN 9780715634295. http://books.google.com/books?id=4CVnAAAAMAAJ. Svanberg, Fredrik (2003). Decolonizing the Viking Age. Almqvist & Wiksell International. ISBN 9789122020066. http://books.google.com/books?id=HxdpAAAAMAAJ. Wamers, Egon (1985). Insularer Metallschmuck in wikingerzeitlichen Gräbern Nordeuropas. Untersuchungen zur skandinavischen Westexpansion. Neumünster: Karl Wachholtz. ISBN 9783529011566. Wamers, Egon (1998). "Insular Finds in Viking Age Scandinavia and the State Formation of Norway". In Clarke, H.B. ; Mhaonaigh, M. Ní; Floinn, R. Ó.. Ireland and Scandinavia in the Early Viking Age. Dublin: Four Courts Press. pp. 37–72. ISBN 9781851822355. Wawn, M.A. (2000). The Vikings and the Victorians: Inventing the Old North in Nineteenth Century Britain. Woodbridge: Boydell and Brewer. ISBN 9780859916448. Ini nga pakli kataposan nga ginliwat dida han 11:50, 23 Enero 2015.